Once window tinting has been applied to your car’s windows, proper care and maintenance are a must to ensure the tint films last. So to help you care for your window tints, here’s a general maintenance guide with cleaning tips and recommendations for products that won’t damage the look of your tinted windows. Why Do You Need to Care for Tinted Windows? Tinted windows require regular care and maintenance to ensure they last as long as possible. 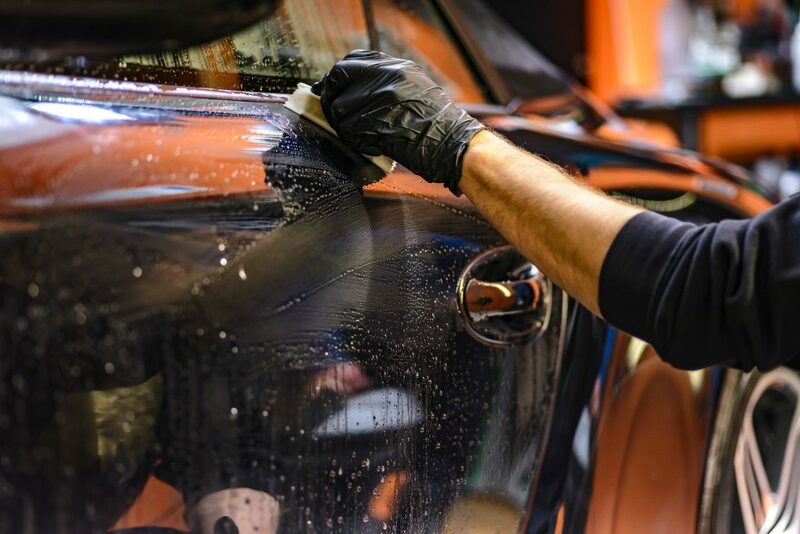 What’s more, regular cleaning will also help maintain the look of your car tint and ensure they’re safe. To save money and preserve your automotive tint, you can make your own ammonia-free tint-friendly window cleaner. Park in the shade. Cleaning windows in direct sunlight will cause the cleaner to dry too quickly, making it hard to clean your windows properly. Find a shady spot or a garage to park and clean your car. Avoid parking under sappy trees like pines, as tree sap can damage the finish of your car. Clean your windows last. When washing your car, save the windows for last. This way, you won’t wind up rinsing or spraying dirt onto windows you’ve just cleaned. What’s more, if you’re using other ammonia-based cleaners, take care not to get any on your tints. For especially dirty windows, apply the tint-safe cleaner ahead of time to make cleaning easier at the end. Spray tint-friendly cleaner and wipe away dirt. An ammonia-free cleaner can be used on window interiors and exteriors. You might need to mix your cleaner in a bucket first–check the instructions on the bottle. To avoid missing anything, wipe interiors and exteriors differently; e.g., horizontally vs. vertically. Go along tint film edges with a damp cloth to clean, following with a dry cloth to dry the edges and prevent cleaner from seeping under the tint film. Use one microfiber cloth for cleaning. And use the other cloth to wipe the windows dry. Use a bucket of water for extremely dirty windows. If your windows are especially dirty, rinse your cleaning cloth in water regularly to prevent spreading dirt around your windows. Take care to avoid getting the edges of the tinting too wet with cleaner or water. If moisture gets under the tint film, the film can peel away from the window. For homes with hard tap water, use distilled water instead of tap water in the bucket. Hard water can leave white spots on your windows. Check for missed spots. Look for missed spots on your windows from both the inside and outside of your vehicle. Change your viewing angles and take a few steps back to catch any spots. If you notice any missed spots, spray the tint-friendly cleaner onto your cleaning cloth, wipe the spot, and then buff dry with the drying cloth. If you notice bubbles in your window tinting, use a plastic card (maybe not a credit card) wrapped in a microfiber cloth to gently push the bubbles to the nearest edge. Use a fine-point needle to poke a small hole in the bubble and release the air trapped under the tint film if the card. If there are leftover wrinkles from the deflated bubble, use the credit card wrapped in a microfiber cloth to smooth out the wrinkles. Here are the top maintenance tools and products to avoid using on tinted windows to prevent damage and ensure your window tinting lasts longer. Avoid using window cleaners that have ammonia. Ammonia-based cleaning products can cause window tint film to become dry, brittle, and imperfect while reducing the darkness of the tint. Do not use any abrasive drying or scrubbing products that can damage tint films. These products include newspapers, paper towels, and scouring pads. Some people might use sharp edges like razor blades to smooth out bubbles in their window tints. But these can scratch and damage your tint film. So instead, use a plastic credit or debit card wrapped in a soft cloth (such as microfiber). Also, avoid steam cleaning your tinted windows. If you need to steam clean the interior of your car, keep your tinted windows rolled down until the steam is gone from your car. Otherwise, the steam could cause damage to the window tint film. To keep your car looking great, don’t neglect your windows when they get dirty. And be sure to follow these tint-friendly care and maintenance tips so your window tinting will maintain its appearance and last for much longer.